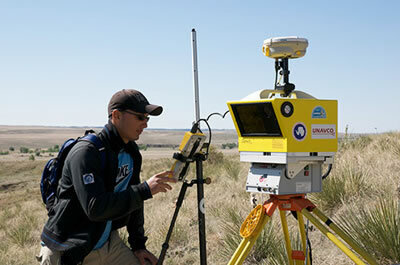 Terrestrial laser scanning (TLS) or ground based LiDAR (light detection and ranging) is a relatively new technology that digitally maps geological outcrops at mm to cm resolution. We report here the results of a trial TLS project that had two main aims: collecting scans for monitoring gully erosion and conducting a survey to connect field methods of TLS with geomorphology. 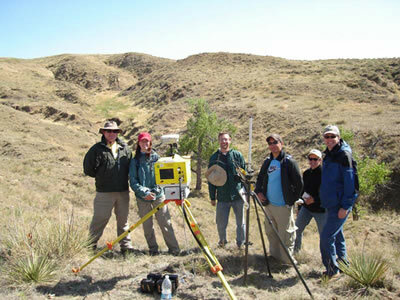 The site of the TLS survey was located at West Bijou Creek, Arapahoe County, Colorado. It consisted of a three-day data collection campaign followed by several weeks of data analysis. Because applications of TLS in geology and geophysics are evolving rapidly, one of the goals of this project is to provide the scientific community with a summary of current field acquisition practices with a web-based forum for sharing ideas and discoveries. The long-term goal of this project is to keep track of the changes in the morphology of the gullies located at the West Bijou Creek using Real Time Kinematic GPS (RTK-GPS) and TLS in several years. In the future this area could become a TLS training area. The purpose of this webpage is to provide the scientific community with a summary of current practices within this project and a link to the online web forum where community members can share ideas and discoveries as they evolve with each study. Figure 1 - RESESS Intern Emanuelle Feliciano Bonilla reads data output from the GPS monument at West Bijou Creek.